Faculty from OSU and Portland State University (PSU) met on November 13 to identify opportunities for community-engaged research and action to address the most pressing issues facing Oregon. Scott noted that OSU and PSU are the only two higher education institutions in Oregon that carry the Carnegie Community Engagement designation. 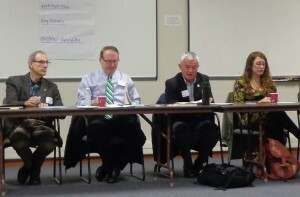 “Toward One Oregon provides a framework for conversation beyond the divides of the state – east/west, rural/urban, for example – and instead helps us talk about connectors,” Scott stated. Healthy people, prosperous communities and flourishing agriculture and natural resources were the three areas of discussion. Relative to these three topic areas, participants identified what they are currently working on; what they think are critical community issues; and what capabilities exist within OSU and PSU. Health equity, the transformation of health systems, aging in place using technology, and investing in economic development to create a framework of livability were some of the issues discussed related to healthy people. 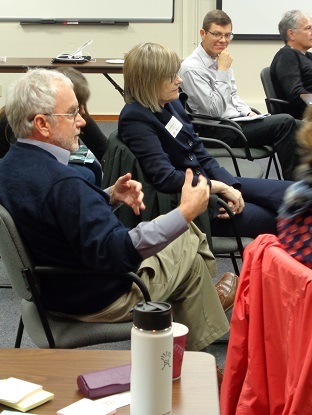 When discussing prosperous communities, economy, housing and land use, education and governance are closely linked. Areas identified as worthy of additional study around agriculture and natural resources include the economics of sustainable agriculture (examining exogenous and endogenous influences); placing a value on ecosystem services; quality versus quantity in the urban and rural environments needs examination on the issue of food access and security (“large farms feed poor people; small farms feed rich people”); and land use and access (aging farmers want/need to use the sale of their land to fund their retirement, whereas, others want to farm, but do not have affordable access to land). Scott and Stephen created an OSU-PSU Collaboration Fund, which offers start-up funds for joint pilot projects between OSU and PSU faculty. The fund is meant to accelerate opportunities for research collaborations serving Oregon communities. 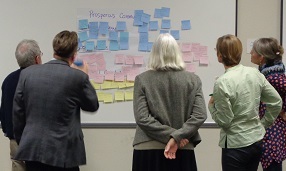 Recognizing that these experiences often require extra resources beyond faculty time, the fund offers seed monies to faculty teams for fiscal year 2015-2016 to support expenses associated with community-engaged inter-institutional projects. Fund details can be found here. 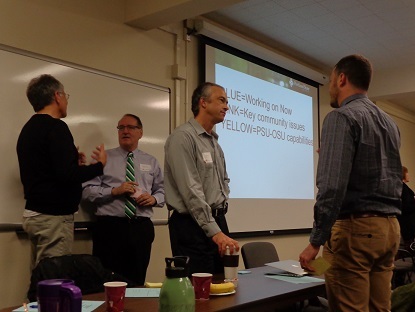 Fund proposals must be submitted via email by December 18 to Patrick Proden, regional administrator for OSU Extension in Multnomah and Washington counties, and Sheila Martin, director of the Institute of Portland Metropolitan Studies at PSU. Grant funds must be expended by June 30, 2016. “This is the beginning of a conversation we hope will continue,” said Sheila. Posted in Community Outreach, From the Road, Partnerships.